With “Cleopatra va in Prigione” – a short novel published in September 2016 for minimum fax – Claudia Durastanti re-discovers and explores the figure of the “flaneuse”: a surprisingly powerful and precise narrative device to describe the contemporary urban condition. Caterina is a girl that walks in the periphery of Rome for the simple pleasure of walking. Through the vast inconsistent nebula of streets and rooms left and scattered around, she can’t help but keep going. The city envelops the life of this erratic suburban population in a buoyant milky incoherence: a fog which is spatial, emotional and pervasive, like the hours spent in the traffic of Rome. The shift from a Parisian bourgeois man to a precarious Roman girl, accompanies off the scene a paradigmatic subject which, from Baudelaire and Benjamin to Guy Debord and the Situationists, inhabited and described the space of the Society of Spectacle, to embrace the uncertain stride of the multitude. Claudia Durastanti will present her book in conversation with Christian Raimo – writer, translator and teacher who lives, works and loves Rome – and Nicolò Bassetti, landscape designer and urban explorer, author of the project Sacro Gra – a journey along the ring road of Rome which prompted the winning movie of the Venice Film Festival 2013. Claudia Durastanti (Brooklyn, 1984) is a writer and translator, and lives in London. She published two novels for Marsilio: “Un giorno verrò a lanciare sassi alla tua finestra” (2010), which won several prizes including the Premio Mondello and “A Chloe, per le ragioni sbagliate” (2013). 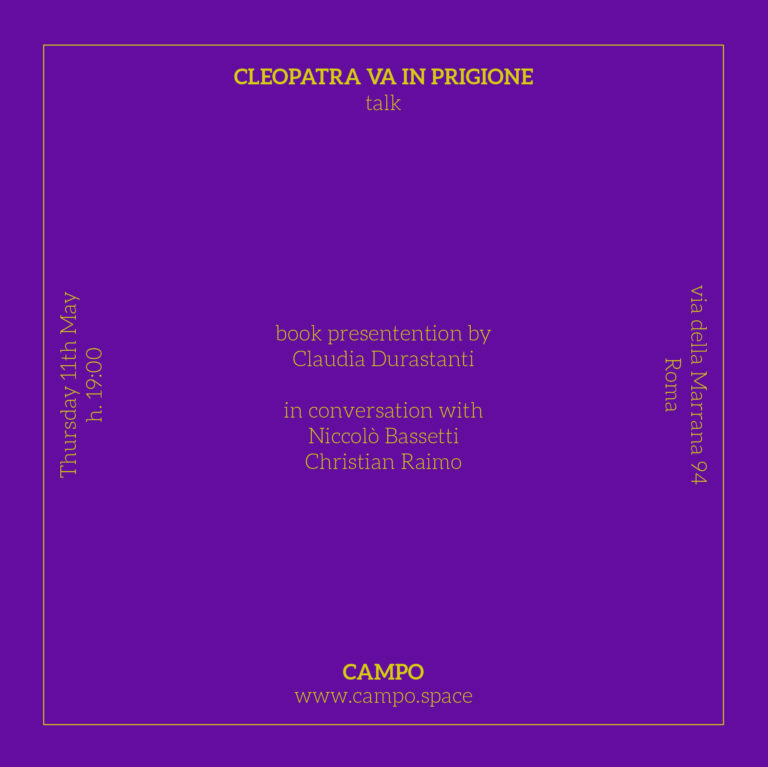 Her third novel “Cleopatra va in prigione” was published by minimum fax in 2016. She writes about books for various magazines and her work has been featured in the Los Angeles Review of Books, Nero Magazine, and La Repubblica. In 2015, she was Italian Fellow for Literature at the American Academy in Rome and selected as one of the best Italian writers under 40. 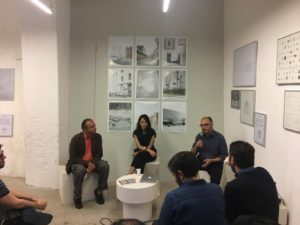 Nicolò Bassetti (Milan 1961) is a landscape planner and urban explorer that works toward reclaiming and functionally redeveloping neglected areas. Founder of Nuovi Paesaggi Urbani, in 2010 he travelled through the neighbourhoods and landscapes of the Raccordo Anulare, Rome’s ring road motorway, covering over 300 kilometres on foot. This experience prompted the book Sacro romano Gra (Quodlibet, 2013), and the film Sacro GRA, directed by Gianfranco Rosi: the first documentary film ever to win the Golden Lion at the Venice Festival. Christian Raimo (Roma, 1975) is a writer and translator which lives and teaches in Rome. For minimum fax he published the collection of short stories “Latte” (2001), “Dov’eri tu quando le stelle del mattino gioivano in coro?” (2004) and “Le persone, soltanto le persone” (2014). As Babette Factory – together with Francesco Pacifico, Nicola Lagioia and Francesco Longo – he published “2005 dopo Cristo” (2005) for Enaudi and for the same publisher he wrote “Il peso della grazia” (2012), “Tranquillo prof, la richiamo io” (2015) and has been author of “Figuracce” (2014). He is editor for minima&moralia and Internazionale.